The eSystem is a true Scottoiler product in every regard. Design simplicity, quality components and robustness are givens and it remains true to its origins. While there are those who will remain skeptical of an electrically driven system, I am not one of them. I have no hesitation in recommending the newest Scottoiler system. Winning MCN’s 2009 Product of the Year Award for Best Accessory/Service was icing on the cake. 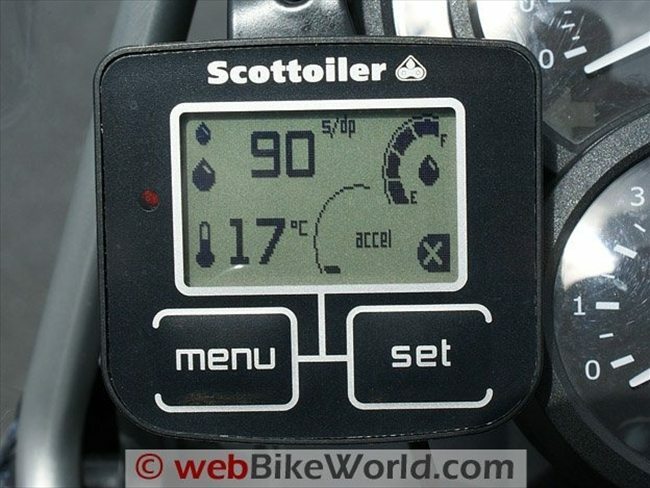 I have been perfectly happy with the vacuum-driven Scottoiler system (review) installed on my F800GS last fall. So a second system for the other F800GS in the fleet was in the works as a late summer or fall project. But, we all know how that works. All of a sudden it was November, our planned month-long sojourn down south was looming and therefore, so was the requirement for a second system, now moved to “outstanding” on the list. 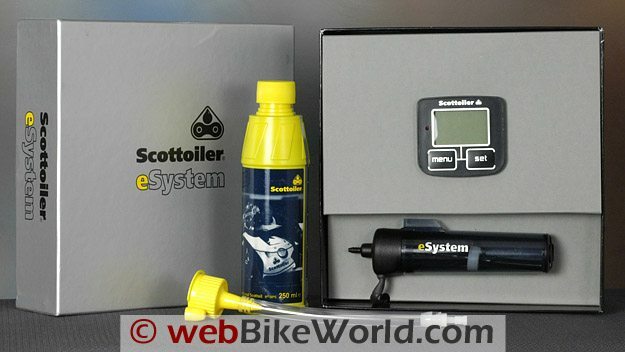 Fortunately, an opportunity to get one of the new Scottoiler eSystem kits was presented — great timing. Readers might remember that an evaluation of the newest Scottoiler system, touted as a plug-and-play type of system, had been planned since early last year. But given a summer-long pre-occupation with evaluating numerous Bluetooth systems, the eSystem evaluation fell off the plate. But long story short, the first eSystem was purchased from our favourite BMW dealer in Virginia and installing it became the first order of business once down at the temporary hacienda in Florida. And the two F 800 GSs were off-loaded from the Worthington trailer, relatively clean for a change. While down in Florida, the Editor let me know that an eSystem was on its way from Scottoiler, meaning that I would have another of the new systems to install once back home in Ottawa. One for each F800GS — this I can take. Travel-wise the original plan had been to trek down to Virginia or the Carolinas and go on an extended trip via the 800s, but the onset of cold and unsettled weather made us reconsider so we kept heading south, ending up in Florida for December. This proved to be a good decision as harsh winter conditions continued right into the new year and for many areas winter is hanging on and with spring only a week away. But even as cold as it was in Florida in December, working outside in a T-shirt and soaking up the sun was something I could live with. Being used to seeing mechanical components upon opening a Scottoiler system box, this one presents a distinct surprise — the first item seen is the digital sensor control module. The Remote Reservoir Pump or ERP component sits alongside. All other system components and installation goodies are packaged neatly under the top-layer tray. The small plastic-cased control module measures 6.5 cm (W) x 6.0 cm (H) or 2.5 inches x 2.3 inches. It has an integral harness comprised of the positive and negative power leads and the multi-pin connector lead that connects to the pump unit. 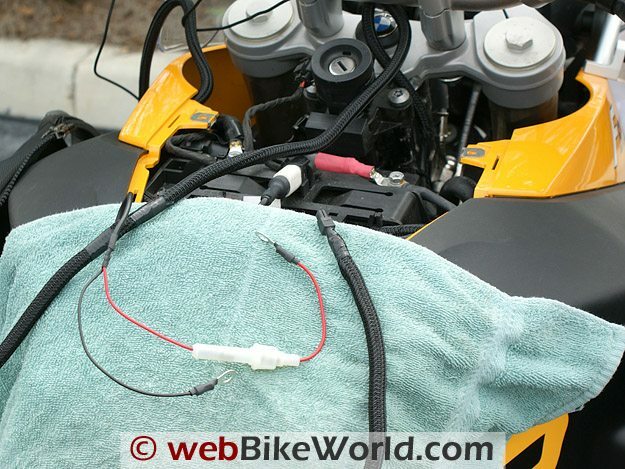 The power lead is long enough to work on any motorcycle I can think of and the pump lead is even longer. The harness is more than adequate for the F 800 GS installations especially since the battery resides just behind the steering head under the dummy tank panel. Including the main components, there is a total of 21 pieces in the eSystem kit and for most installations, nothing else, less the basic tools, will be needed. As with the original kit I used there is a good selection of mounting pieces to provide options for routing the feed tube and installing the dispenser assembly. For those used to the original Scottoiler systems, the eSystem will be a revelation of sorts. 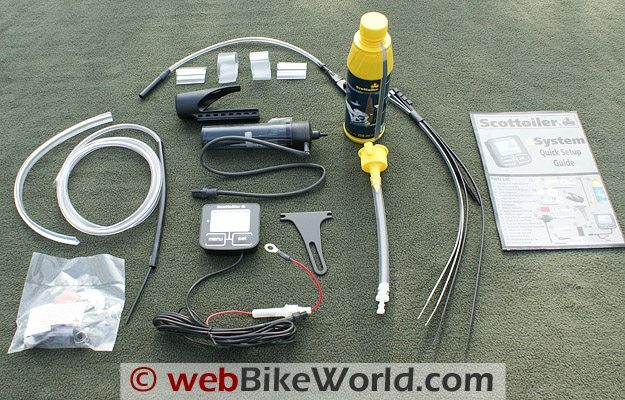 It uses the tried-and-true pump delivery method, but overall system function is digital based and performance parameters can be adjusted on the fly by the rider. Leveraging MotoGP technology, a triple-axis accelerometer located in the display module is the heart of the system. It senses motion and measures acceleration and vibration in G-force in activating the system. Information is then displayed on the module’s graphical display in real time. Acceleration and vibration in ‘G-Force’ using a triple axis accelerometer and displays this information on screen allowing riders to monitor activity. 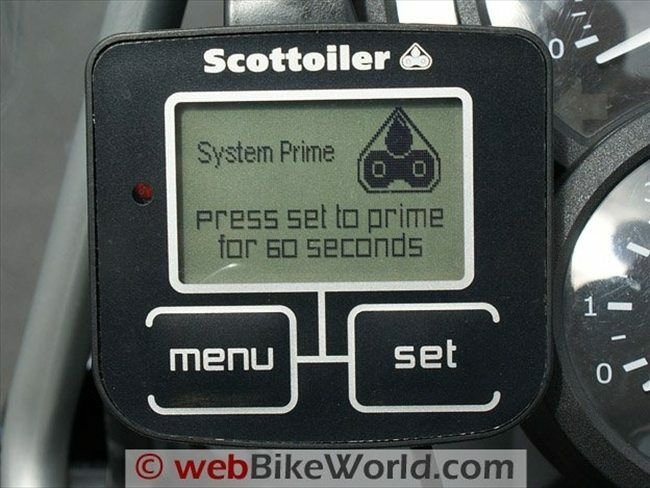 Only when the motorcycle is in motion does the system deliver oil and a constant flow rate is provided. The eSystem uses a small very low power electromagnetic piston pump to deliver the oil rather than the vacuum-based approach used on the original and Mark7Touring systems. And speaking of power, the unit consumes around 3 mA when running with occasional peaks when the pump activates or is priming. With the engine off and eSystem in sleep mode it consumes a miniscule 400 µA from the battery – less than a typical alarm system. Leaving the system connected for extended periods of inactivity is not an issue, but if there is concern, removing the 0.5A glass fuse or disconnecting the battery leads will address the matter. I have a couple of the fuse holders for accessories tucked just under the front right edge of the dummy panel that I can access without removing the panel itself. In many regards the system is almost plug-and-play. As long as the power harness is connected to the battery or optionally an alternate supply source, the delivery components are installed, the pump lead into the reservoir is connected, oil loaded, and the check valve installed, the system is ready to go. Even with the addition of the digital sensor control module there is a lot of flexibility in where and how the main components are installed. The sensor module can be mounted almost anywhere within viewing range and as long as clearance and angle constraints are followed the reservoir/electronic pump or REP unit is mountable on any available real estate. Even though both eSystems were installed at different times, the procedure was pretty much the same and installing the second system went even faster as all the procedures had been done once already. Removing the dummy tank panel and the right side plastic frame plate is about all required to prepare the F800GS for receiving the eSystem. Browsing through the familiar coloured installation handout a few times didn’t ring any alarm bells and it seemed to indicate that all would be clear sailing, and with one exception, it was. 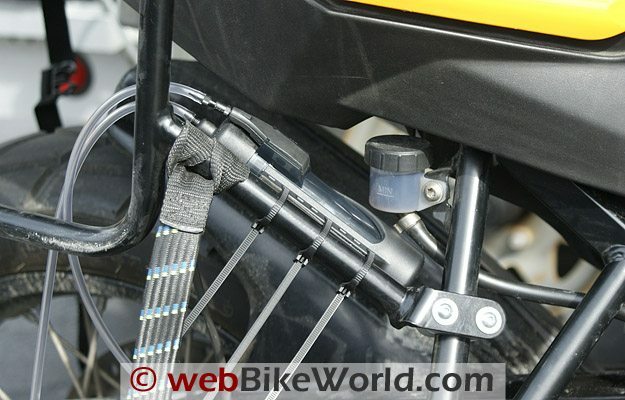 A generic plastic holder bracket is included in the kit, but Scottoiler has a specific clamp made for the F650/F800GS models that makes for a perfect fit on most models (depending on where emission control components are located). Two email requests to Scottoiler resulted in two custom clamps being received, within a week of each request — great service. With this issue resolved, it was time to mount up the sensor module. This component can be mounted flat, using adhesive tape or hook-and-loop, or hung using the provided display mount Y-bracket that bolts to the back of the module. The bracket can be rotated 360 allowing four fitment options. 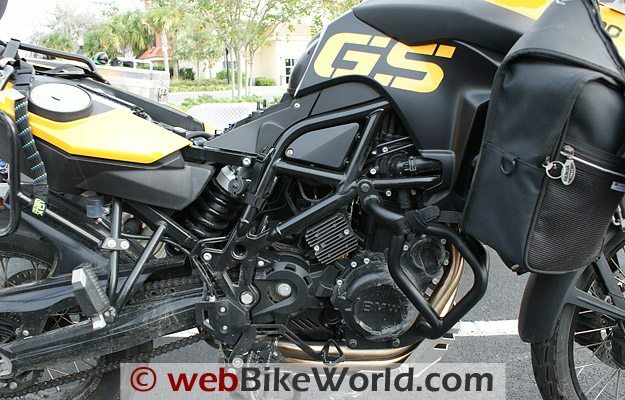 The first installation was on the Yellow F800GS and I ended up trying two spots: mounted to the left of the Touratech GPS mount using one of its mounting bracket holes. This put the module in an easy to see and easy to reach spot just above the handlebar. But after using it in this position while down south, I moved the zumo 660 over to this machine, so the eSystem module had to move. It now sits just to the lower left of the instrument pod secured to the left tube of the BMW touring windscreen frame using a small clamp. The module is well protected here, still easy to see and despite the rubber-mounting, functions as advertised. The second kit was installed on the older Dark Magnesium Metallic Matte machine, otherwise known as the test mule. For both installations I used Techflex Flexo wrap to sheath the battery and REP leads. I still like the harder plastic wrap for some applications, but the flex type of wrap is pretty much all I use now. With the power leads connected (positive first, negative second) and tidied up, the REP power lead was run down the right side between the air-box and the right side panel. This put the lead in the ideal spot, underneath the triangular-shaped plastic panel and directly above the spot where the pump would be mounted. I actually used the generic holder bracket for the first installation done while in Florida, installing the pump on the right-side forward tube of the Touratech pannier rack. This served to hide the whole assembly behind the pannier when mounted. The pump connection lead was still long enough and the system worked just fine from its temporary home. The F650/F800GS clamp bracket works well, but I make one small change that allows the whole reservoir assembly to fit even better inside the frame. I move the thin L-shaped mounting bracket from the rear of the clamp bracket to the front and point it forward. With this done, the clamp can be slide up to a point just behind the air breather/filler and the bolt tightened up. My modification places the reservoir assembly a bit further back, providing more clearance for the check valve and dispenser assembly tubing. Once bolted in place, the reservoir can be rotated in slightly so its sits snugly inside the trellis frame, just above and to the rear of the rectifier. To mount the unit up, both front and back TORX screws securing the rectifier to the frame must be removed. A small washer, provided in the kit, is used as a spacer with the front bolt. This offsets the thickness of the mounting bracket at the rear mounting point. Despite various installation options diagrammed on the handout, I took the expedient route out and duplicated the original mounting and positioning effort completed for the vacuum-based system. This runs the delivery tube down inside the frame tubes, along the swing-arm, crossing over to the inside edge where the rear guard mounting bolt is located. I used the 10 mm plastic spacer and dispenser plate and clip bracket supplied in the kit for both installations. The spacer moves the dispenser plate and thus the dispensing nib further away from the swing arm and centres it over the chain for oiling efficiency. Minor adjustments left or right can be made by gently bending the dispenser plate arm with a long blade flat screwdriver. The stock Torx bolt was replaced with an M6 x 30 mm stainless-steel socket-head bolt and with the drip tube/nib secured in the dispenser plate by the clip bracket (pipe-clamp) and the Nylock bolt tightened a bit, initial positioning of the dispenser nib was done. Typically this puts the nib between the 5 and 6 o’clock position, with the angled edge facing out and just clear of the sprocket (beside or slightly ahead). Now the Nylock nut can be tightened down. Installing the dispenser is typically the dirtiest step, especially if the wheel has not been removed and work gloves of some type should always be worn. I typically use a 10 mm socket on a long extender and reach through from the left side of the motorcycle to access the Nylock nut or alternatively, just use an open end wrench to access the nut from the right side. When the motorcycle is started, the eSystem begins measuring the vibrations it senses, caused by the motor running. There are three function modes, all represented by small icons. The initial mode indicator is an ‘X’ but once the system senses the engine is on, it changes to a ‘√’ (checkmark) and once the motorcycle is moving the ‘↑’ (up-arrow) icon will be displayed. Each mode is triggered sequentially depending on vibration levels as the system samples the vibrations and through averaging, determines what mode the system should be in. Oiling only starts when the ‘Arrow’ mode shows. From a start-up and monitoring perspective the system will react differently on different motorcycles. The F 800 GS, somewhat like a big single, has a healthy start-up/warm-up pulse, so the eSystem turns on initially after a few seconds, but then shuts down a few seconds later is not motion is detected — this is normal. Motorcycles that have very smooth engines, like many in-line triples, fours or sixes might see some delay in the system turning on: actual forward motion may be needed. This is normal behaviour for the unit and is not a major concern. The system can be made more sensitive to a degree by simply moving the digital sensor module to a different location or mounting it differently. Using the custom bracket, as I did, works just fine mounted directly to a bolt or via a rubberized clamp. The bracket is very lightweight and that fact alone allows more intrinsic vibration to come through. Actual initialization is simple. Start the motorcycle or alternatively, turn the system on by holding the menu button for a couple of seconds. Up first will be the ‘Introduction’ screen, followed shortly by the ‘Driving Screen’ that displays flow rate (seconds per drop), oil level, mode, acceleration and air temperature. Pressing ‘Menu’ once gets you to the ‘Prime Menu Screen’. Pressing ‘Set’ once initiates a ten second prime cycle (hi-rate) indicated by the blinking Red LED on the left side of the module. If desired this process can be repeated until such time as oil fills the dispenser tube and starts to drip from the dispenser nib. Before going farther the reservoir can be topped up with oil. Coming back to the system, press ‘Menu’ until the ‘Reservoir Menu’ screen appears and hold ‘Set’ until the reservoir bar moves up to 100%. 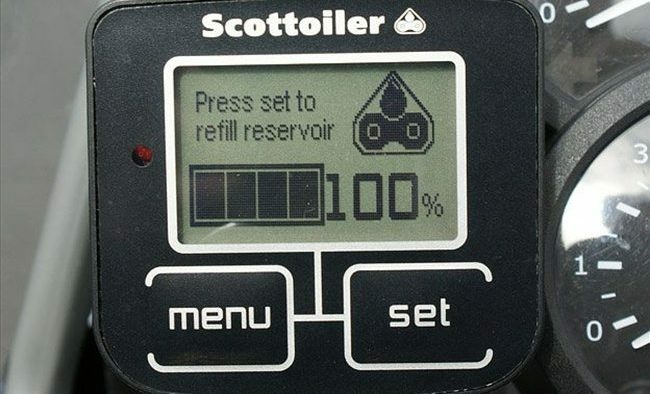 The system can be set to 25/50/75% as well and just remember to set the level when the reservoir has been serviced. 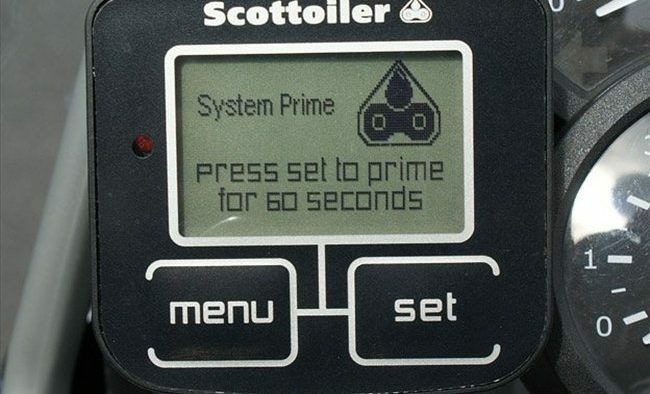 Now press ‘Menu’ to go back to the ‘Driving Screen’ and press ‘Set’ repeatedly to adjust the flow rate (expressed as seconds/drip or s/dp) to the desired level. Flow rate selections from the menu are: 180 – 120 – 90 – 80 – 70 – 60 – 50 – 40 – 30 – 20 and Off. 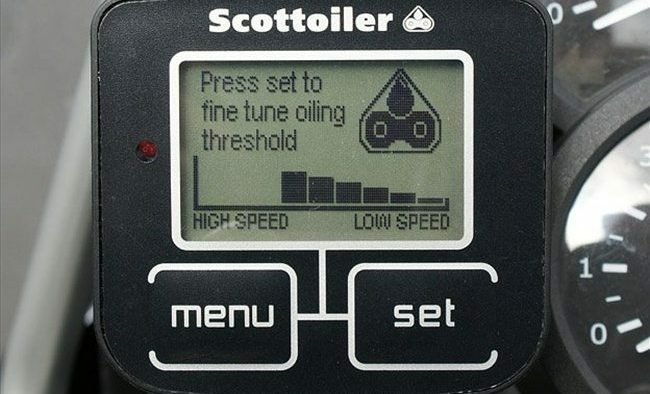 Scottoiler recommends a start point of 50 go 60 s/dp. This is a pretty steady rate, but it does make initialization and checking how the system is working a more expedient effort. For the F800GS machines the typical rate if 120 or 90 s/dp seems to work quite well for most riding activities. Individual users will need to spend some time in finding the ideal rate(s) as applicable…but this is much easier to do via a simple screen entry rather than ‘dialing’ the older systems in (even though that method works just fine). A key component in the initialization and delivery process is the check valve assembly. It is important that the check valve be installed and that it be oriented correctly in accordance with the arrow marked on the valve (→). The check valve keeps oil from moving down the feed tube when the motorcycle is not moving. A little hint: speed up priming the system by removing the check valve assembly and connecting the feed tube directly to the reservoir. This gets the feed tube filled in three to four prime cycles and really helps with the F800GS given its long-legged swing-arm. Riding also does the trick! 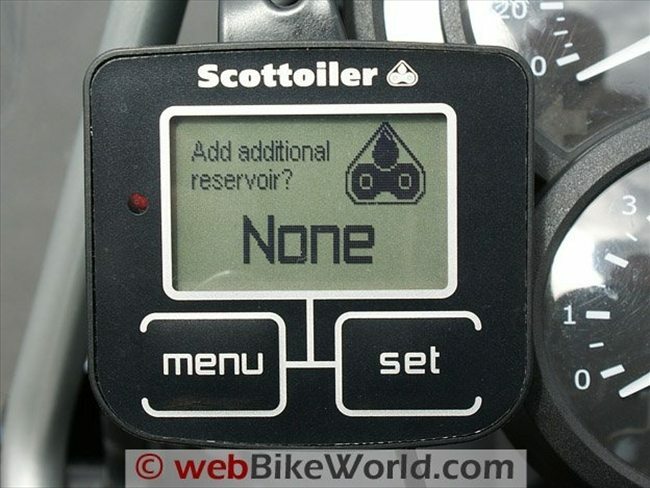 The reservoir holds 60ml of Scottoil (Blue = regular or Red = High Temperature) which typically works out to five to six extra hours of riding before having to refill the reservoir as compared to the vacuum operated system. Achieving what is probably close to an extra day of riding is due in large part to the precise measurement and pumping of the eSystem. However, just remember the data is still a guide, albeit more accurate per se than the vacuum system. Accordingly both the flow rate and lubrication status need to be monitored, easily done visually on both counts. Monitoring the system when it is first put in use also provides the opportunity to become familiar with use requirements to satisfy different types of riding and conditions, etc. With about 4000 kms of distance accumulated on both 800s since the eSystems were installed, both just keep pumping along, dishing out the blue stuff in precisely measured and timed drops. The vacuum-based system was totally transparent in use, less filling the reservoir and it seems the eSystem is going to be the same. The newest eSystem installed on my F800GS has updated firmware with a revised setup order and a new menu selection available after the ‘Calibrate’ screen. 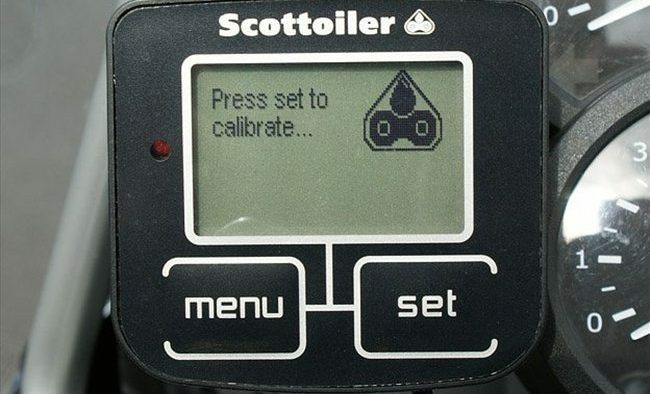 This added capability allows fine tuning of oiling (delivery) thresholds, set dynamically between High Speed and Low Speed on the displayed scale. This is an interesting feature that I am still exploring. Once some data has been collected I will provide some feedback. When the engine is off the eSystem draws less than 1 milliAmp of power. 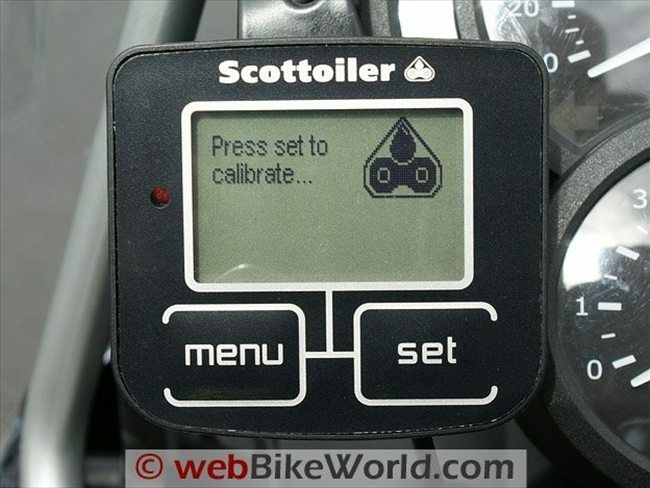 The graphical digital multi function display allows the rider to adapt the flow rate of the oil while riding to suit the riding conditions. 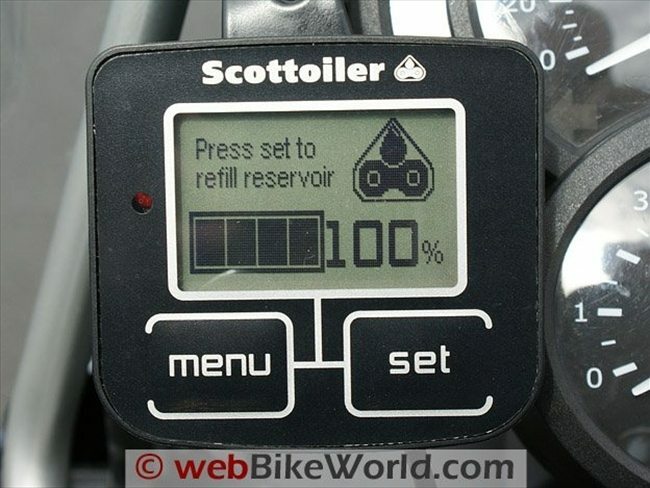 The reservoir holds 60 ml of Scottoil, which, according to the company, equates to an extra 6 hours of riding before refills compared to the vacuum operated Scottoiler system. The eSystem differs from the existing Scottoiler vSystem and Mark7 Touring kit by utilizing an electromagnetic piston pump to deliver oil. The electronics involved in the eSystem have come from Moto GP technology where a triple axis accelerometer senses the motion of the bike allowing the system to know when to lubricate the chain. TThe eSystem provides a constant flow rate of lubricating oil, independent of temperature. The eSystem is motion sensitive, so it will only lubricate the chain when the motorcycle is moving. The benefits of chain management are well understood and a critical part of that management is chain lubrication. In this regard Scottoiler systems have been lubricating and extending the life of many chains for many years. Keeping a chain properly adjusted and properly lubricated provides efficiencies, longer life for drive components and even though many doubt this, a quieter ride . For those who enjoy travelling over all types of terrain, for long periods of time, a chain oiler should be one of your best friends. The eSystem remains true to its roots and I have no doubts that both eSystems installed on the F800s will provide years of faithful and reliable service. It is fully compatible with existing Scottoiler optional components, including the Magnum and Lube-Tube increased capacity reservoirs and the Dual Injector dispenser. There is actually a separate Menu for managing an add-on reservoir. 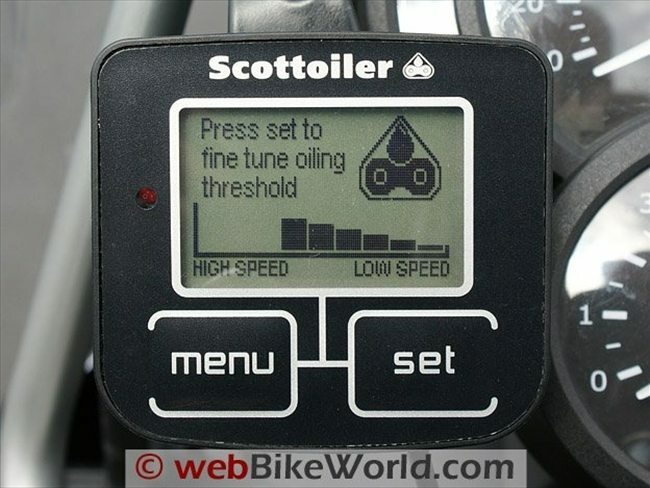 My experience with Scottoiler, especially in getting information and technical support remains outstanding. Everyone, from its inventor on down have one focus — getting the most innovative and the best products to consumers. I can live with that. Colors: N/A Made In: Unknown. From “A.F.” (June 2012): “Another commenter voiced concerns that modern chains don’t need to be oiled nearly as much, and stated a concern that this system will put enough lubricant to attract a lot of dust and grit, leading to faster wear on contacting surfaces. As a point of fact, one of the advantages of this lubrication over heavier wax or spray-on types is that the oil has a great tendency to be flung from the chain over time, carrying contamination with it. As long as you’ve set the flow properly, the amount of fling is nearly unnoticeable, but the cleanliness of the chain is quite impressive. 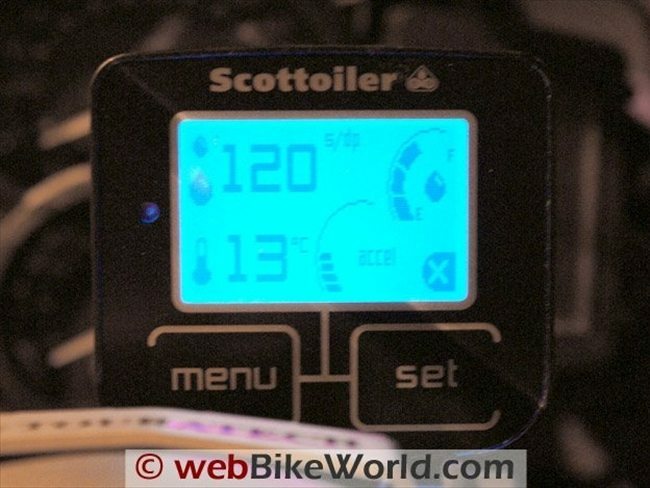 I purchased a Scottoiler system second-hand and installed it with a new chain and sprockets. After 10,000 miles, the chain and sprockets look just like they did after my first ride with them. No detectable wear on any of the contacting surfaces, and I also haven’t had to adjust the chain tension once or clean it once — it’s been that effective! The first chain had 10,000 miles on it when I bought the bike, and I got another 5,000 miles before I realized it was in bad need of replacement, even with pretty attentive maintenance. The rear sprocket also showed very noticeable signs that the tension side of the teeth were worn. And yes, the way the oil travels to the outside of the sprocket lets it slide right into the rollers of the chain, and through typical chain movement, it gradually wicks its way to other important areas. I’ve never been so impressed by the simplicity of an idea and its execution to address an otherwise tedious task. From “M.H.” (7/10): “I have the Scottoiler MK7 and am ordering the eSystem next payday. I put a MK 7 system on my KLR-650 last fall and love it, it has cut down on chain cleanings significantly, and one does not realize how much they fiddle with the chain till they no longer do it. I am putting one on my wee-strom, which is my main transport, now that I have another one after my first one was destroyed by an inattentive car driver. The KLR was a stop gap, that I plan to keep. I ride year round in Ohio and in temps below 20 F, the MK-7 does not feed oil very well, I have to put it on or near prime to get oil to flow, and some times in really cold temps it does not flow enough to clean the chain from salt, no more with the e system. My RMV is nearly vertical on the KLR and will not be so on the wee, so I am worried about oil flow in cold weather. I put off an oiler for years, a big mistake now that I see how little I have to fiddle with the chain on the KLR, and have not had to adjust the chain since putting it on roughly 7k miles ago. I use DuPont Teflon wax currently, on the Suzuki, but not for long. From “R.S.” (3/10): “Modern motorcycles come with O-ring chains that barely need any additional lubrication at all. Why would anyone pay over $300 for a Scottoiler system, and who knows how much more for installation, when you can quickly and easily just spray your chain with a $5 can of DuPont Multi-Purpose Teflon lube? As a side benefit of using the DuPont product, your bike will stay cleaner (I’ve been using DuPont Multi-Purpose Teflon lube (review) on my chain for a few years now, and my chain and rear wheel still look like new).